Reolink has provided a range of do-it-yourself security solutions for businesses and consumers for nearly a decade. 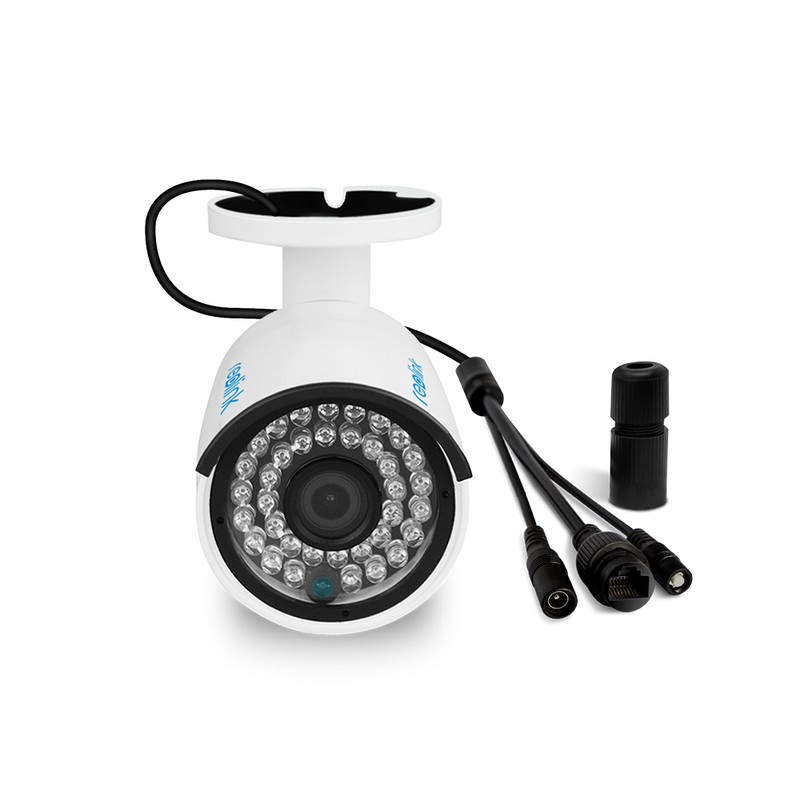 Its latest is the eminently affordable RLC-410 4MP Fixed Lens PoE Security IP Camera ($80). This indoor/outdoor cam can be used independently or as part of a more comprehensive surveillance system, and it provides exceptional image quality and features for the price. 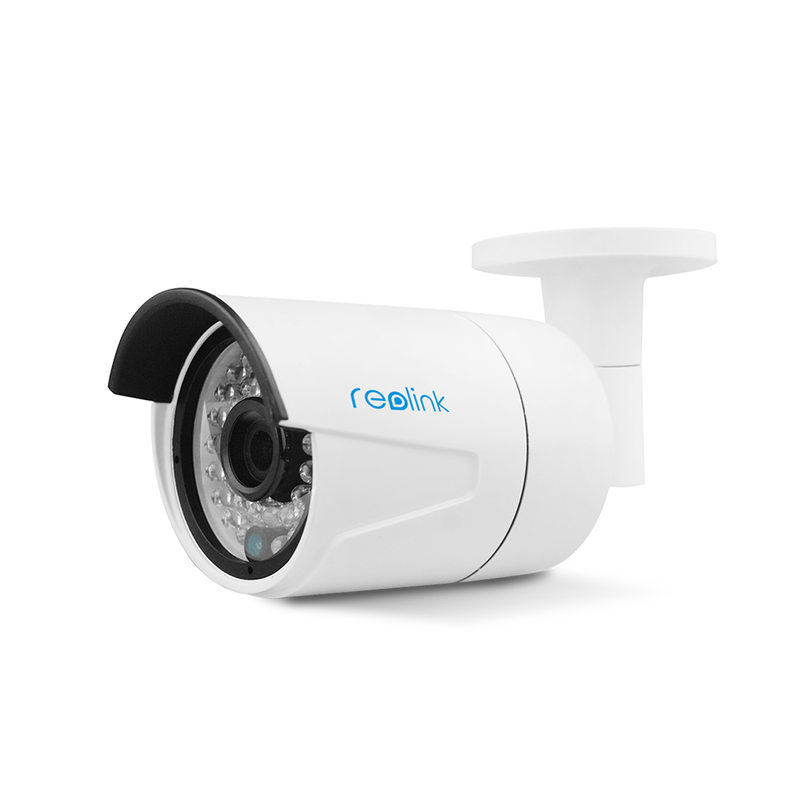 The RLC-410 takes its design cues from CCTV cameras, rather than the webcam-style home monitors so popular now. In that, it screams surveillance—this isn’t a device you can nestle inconspicuously between a couple of vases on a bookshelf. Further, its waterproof cables and aluminum-alloy body indicate it was designed with exterior environments in mind. The RLC-410’s waterproof aluminum body is built for outdoor installation. It’s not a wireless camera, but you’ll need to pull only one cable to it because it supports PoE (power over ethernet). That means it draws electrical power from the same CAT5e (or higher) cable that its video travels on. This provides lots of flexibility in locating the camera, because it doesn’t need to be near an electrical outlet. Those are are rarely located on the exteriors of most homes, and hiring an electrician to install one can be an expensive proposition. If you don’t own a router or switch that supports PoE, on the other hand (and few consumer models do), you’ll need to purchase a PoE injector and add it between the camera and your router to take advantage of this feature (these typically cost between $15 and $20). Alternatively, you can use the provided AC adapter to connect the camera to a conventional power outlet. None of this precludes you, however, from using the RLC-410 as an exceedingly sturdy nanny or pet cam should you choose to bring it inside. The fixed-position bullet cam features an 80-degree viewing angle with night vision up to 100 feet, courtesy of a whopping 36 infrared LEDs. Its built-in mic can capture audio up to 15 feet away, and the 4MP (2560x1440 HD) promises superior video quality to the 1080p resolution common to most IP security cameras. The RLC-410 also differentiates itself from most other DIY security cams by not requiring a cloud subscription to store video. If you use the camera independently, your can save footage locally to your PC. If you don't want to leave a computer running 24/7, or if you want to use multiple cameras as part of a larger security system, you can purchase one of Reolink’s standalone wireless NVR (network video recorder) security systems for $300 (with support for up to eight cameras) or $450 (supports up to 16 cameras). To hook up the RLC-410, you just plug it into to your router via the supplied ethernet cable. If you have one of the aforementioned PoE-supporting devices, you’re done. If you don’t, you’ll also need to plug in the supplied power adapter. Both the camera’s ports are located on a triple pigtail of cords extending from the camera’s mount—the third one houses the camera’s reset button for easy access. There are two ways to add the camera to your network. The simpler one is to use the free Reolink mobile app. Once you download it, you add the camera by scanning a QR code on its base, then follow the setup wizard. The other way is to install the desktop client on your PC or Mac, and then manually type in the camera’s UID or have the client scan your network for the device (your computer must be connected to your LAN for the latter). Because the camera has no stand, it must be mounted to a wall, ceiling, or other surface. This is easily done using the included screws and mounting-hole template, and the upside is an intruder isn’t likely to make off with your camera. Once the camera is affixed, you can adjust its viewing angle with the turn of a few Allen screws: both the mount and the barrel of the camera rotate 360 degrees, while the camera’s stem has a 90-degree arc. All the camera’s settings, including motion detection, can be managed from both the free Reolink mobile and the desktop client. But that’s not to say they’re equal. The mobile app is only for remotely viewing the camera’s live feed; when motion is detected, it won’t trigger a video recording on your device (though you can manually start a recording or take a snapshot from the app when you receive an alert). You can adjust the camera sensor’s sensitivity for diffrent periods during the day. If you want the camera to automatically record video when it detects movement, you must use the desktop client. This is a four-part process. First, you calibrate the camera sensor’s sensitivity (on a scale of 1 to 50: the lower the number, the higher the sensitivity) for different times of day. Then you schedule what days you want automatic recording enabled. If you want to monitor specific areas within the camera’s field of view, you need to define those spots by dragging your mouse over the camera image. Finally, choose how you want to receive alerts (push notifications, email, or both). The one rub is you need to keep the desktop client running during the times you have recording enabled. All that customizability is one of the camera’s strengths. It allows you to tailor the camera’s activity to the rhythms of your home or business, and it dramatically reduces the number of false alarms. The video quality is remarkably crisp, too, especially in night mode when those three-dozen LEDs can really light up the corners of a living room or illuminate a side yard with no street-light coverage. The mobile app and desktop client have a bit of a learning curve—partially because they include features that are only useable with the Reolink NVR—so keep the Quick Start Guide handy when you first start poking around. 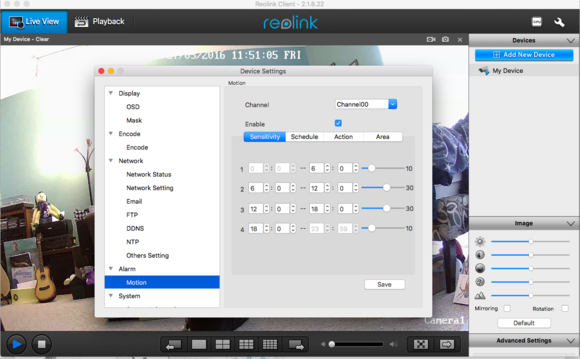 Reolink’s RLC-410 performed admirably. Whether or not you should buy one really comes down to how you plan to use it. Given the system’s design, it seems best suited for serious surveillance of your business, the area around your home, or a remote property. In that case, you’ll probably want to purchase a few of them—not a bad idea, given the low price—along with the standalone NVR, which will give you plenty of storage for around-the-clock recording. If you’re just looking for a simple way to keep tabs on the home front and any pets/elderly parents/kiddies within, there are better options among the many Dropcam-style monitors in our guide. You’ll pay a bit more, but you’ll also get more features, such as sound detection and battery backup, and maybe even a wireless setup to boot. This is a great camera for monitoring your business or the exterior of your home, particularly as part of a multi-camera setup. Reolink’s 8-channel NVR can be the hub of a powerful security system for anyone with serious surveillance needs.